IT WAS EXACTLY ONE YEAR AGO from today, on March 5, 2005, when I had completed a grand sixteen and a half month trip around the world, which took me to across 95,000 miles in thirty-seven countries in South America, Africa, Europe, Asia, and North America. To make a long story short, in the past year I have slowly acclimatized back to normal society after being “traveled out” — working, partying, and playing video games — and one year later, I have to say, my life is “normal” again. This of course means I should probably get back on the road. “DID YOU GET YOUR TYPHOID SHOT?” newfound Blogreader and fellow traveler Jess asked me one night over sushi, a New York City staple. “I already had one,” I told her. Upon a little research I discovered she was right. The typhoid vaccination is only good for two years; in my yellow WHO travel health certificate I saw that I had two typhoid vaccines recorded, two years apart. And so I called up my doctor and left a message at his busy family clinic to call me so that I could prevent a preventable disease in Africa. Yes, it would be a shame if I got it. DAY 1: “And your last name is Trinidad?” asked the pretty Air France check-in clerk at JFK’s Terminal 1 after I had given her my shiny new passport. “Are you from Trinidad?” She seemed pretty enthusiastic about it. “No,” I disappointed. “Are you?” She had a very Caribbean look about her with flawless coffee-toned skin. “No,” she said, still excited. It was probably just a part of her job to be so. “Oh, that’s usually the reaction I get from Trinidadians.” I zipped up my bag for the weigh-in while she checked me in on the computer. “Oh, you are going to Bamako! ?” she said excitedly. I figured she was just used to people checking in for the red eye to Paris, the usual final destination. DAY 2: When I told people I was going to Mali for my next trip, most confused it for Bali, Maui, or Malawi. Mali, if you look on a map (or just Google it) is the largest country in western Africa, encompassing fertile soils of the Niger River to the south and the Sahara Desert to the north. This trip to Mali is my third visit to Africa, the first being a two-week safari through Botswana to Victoria Falls in 2000, and the second time being four months of my big Global Trip 2004, traveling from Cape Town to Cairo and over to Morocco. This time around was no different, in that it brought me all back to the scams, hustles, touts, and general confusion of traveling through a developing African nation. If backpacking is a video game, then Mali is definitely one of the harder levels (Level 1 being Australia, Level 2 being Thailand, etc.) but I was up for the challenge. “Est-ce qu’il y a une banke pour echanger l’argent?” (“Is there a bank for exchanging money?”) I asked in my high school French. He told me the general direction, but stammered in the translation and only confused me. Then he offered to take me there if I wanted. “D’accord. [At eleven,]” I told him. He said he had some errands to run, but would meet me. He left while I attended to my coffee and bread alone in the restaurant, until another face stopped by to greet me. It was Hassan, the tout from the night before, coming to offer me more business. He sat at my table uninvited, and pushed some tourist pictures on me along with some small binder with itineraries and a hokey-looking certificate of tourism — a must-have for all touts around the world. I gazed at them but declined. Then he offered to take me to a place to exchange money, and I declined again. Seeing that I wasn’t going to give me any business, he went with Plan B and accused me of short-changing him the night before. In his rhetoric, he told me that I still owed him CFA 1000 because I only gave X amount to the driver and X amount to him, and X amount went towards the drinking water. I told him he should take it up with the driver and that I didn’t have any change anyway. I walked away and went back to my room. DAY 4: “Erick!” called the voice of the conductor to the mob of people waiting at the front door of the bus. “Ici!” I called out — although the guy knew there was only one Asian-looking guy in the roster and knew where to find me. He waved me in and I boarded the dusty bus with no air-conditioning (not even a fan) just before high noon. DAY 5: Segou has a great significance in the nation of Mali as a whole, as it is the origin of the Bambara people, whose language is second to French in the country. The history of Segou can be traced back to the early 18th century when all the area tribes were joined together and formed an empire that was crushed by the French in the late 19th century with their guns and nasal accents. “Huh?” Immediately I thought I had fallen into a scam again; I’d go with Van and his gang to some place no one heard of, or, we’d actually go to Mopti, but end up in some place I didn’t want to stay so they could make a commission off of me. It was a common practice amongst guides in India and South America. DAY 7: Many people think it is Timbuktu or the famous mosque of Djenné that draws visitors to Mali, but that honor actually goes to Dogon Country, the most visited region in the country — I had even seen it on the Globe Trekker show as one of “Africa’s Great Treks.” “Dogon Country” describes a region about two hours southwest of Mopti, of tribal villages along the base of a sandstone cliff that overlooks the dry and dusty plain that stretches far off into the horizon. Many visitors wisely visit Dogon Country in January during the annual Festival of Masks, when all the villagers come together and dance, but I’d be doing my trek in late March, during one of the hottest and driest times of the year, which would give me a look inside regular Dogon life when the hordes of tourists aren’t poking around with cameras. DAY 8: After a simple breakfast of tea, bread and Laughing Cow cheese (a staple of mine in Morocco), a man came over to my table to display some handmade statues and trinkets to sell to me. As interesting as they were, I didn’t buy anything (I almost never do) and simply said, “Non, merci.” Unlike vendors in other countries, he took no for an answer and simply packed up. Wow, that was easy, I thought. DAY 9: Our encampment in Begni Mato was run by a family led by a father of five young boys, each doing cute young boy things: crawl, climb steps, and read French children’s books. That all changed when one of them had noticed a small snake slither into the village and called all the neighborhood kids over. Together, the kids beat the crap out of the snake, stoning it and beating it to death with a stick. How’s that for the start of a Sunday morning? I thought to myself. DAY 10: Van had been asking me for days if I wanted him to arrange a Timbuktu tour for me — a “standard” three-day tour with a private car, where I’d go with a driver in a 4WD from Mopti to Timbuktu, meet a guide, stay one night, tour the city, then ride on a camel into the Sahara to sleep one night in the desert at a Tuareg bedouin camp before taking the 4WD back to Mopti. For days I’d been telling him to wait until we got to that point for me to make that decision, and that time was finally upon us. DAY 11: As I mentioned in an earlier entry, I had recently received an email from Butch (Egypt) who said he admired my style of backpacking, where you spend a little more money — as opposed to “slackpacking” (a term he coined that I will definitely borrow) when you travel on the super cheap. Not that there’s anything wrong with slackpacking — it is adventurous and perilous, and above all, cheaper — it’s just a different kind of travel. I don’t know if its because I’m older or more financially stable, or just tired, but so far I hadn’t regretted paying the extra money to have Van guide me around. DAY 12: The name “Timbuktu” evokes images of a mythical city, a place impossible to attain like Shangri-La and El Dorado, a place where you are awarded with gold and riches if you could only just get there. In reality, Timbuktu does exists in northern Mali; it is a city on the fringe of the Sahara Desert, originally a settlement of Tuareg nomads that was overtaken by Moroccans as it became a central market place along trade routes in the days of classic medieval Africa. While Timbuktu is just another city in Mali that is less accessible than most, it doesn’t stop modern-day travelers from trying to attain it, the way the explorers of the early 19th century did. A common way to get there during the rainy season is to take a 3-4 day boat up the Niger River, but in the dry season, Four Wheel Drives rule. DAY 13: There are two kinds of Tuareg people: the nomadic ones that roam the Sahara and live off the few elements the desert has to offer, and the Tuareg people who had settled into cities and modernized and live off produced, material things. Hama was definitely one of the latter with his modern clothes and questionably rightfully-acquired car. DAY 14: The sun gradually rose up over the Sahara sand dunes, warming up the landscape from a frigid night 10 km. 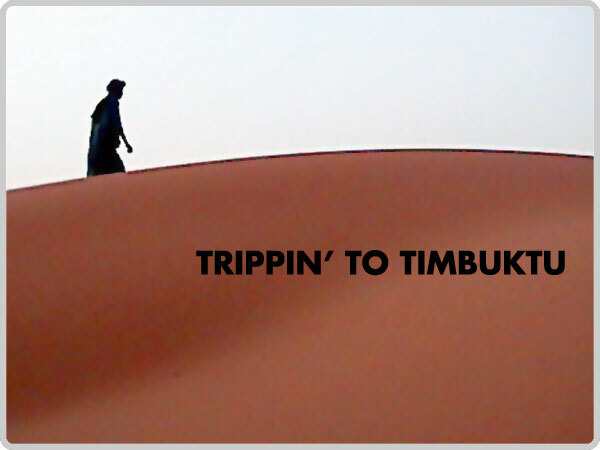 outside Timbuktu. “Bonjour,” I greeted Alco. The simple nomadic Tuareg life of him and his family continued that morning in the encampment. Alco tended to his flock while his children looked on, who then later joined him for a little quality family time with dad and Aura (picture above). The women started up a fire to cook, but for meals later; breakfast for me this morning only consisted of tea, nuts and dates. I didn’t complain for this was the way they lived in the desert simply, peacefully. It’s a shame that it had been tainted two weeks prior; I’d heard from multiple sources that the U.S. Army had secretly been deployed there, the desert outside Timbuktu, for combat training under desert conditions before being sent off to Iraq. TWO DAYS IN PARIS. After two weeks in Mali, I’d have two transitional days in a Western metropolis before heading home. It would be my third time in France’s capital city and this time I’d go not as a tourist, but just a tired guy on a layover from Bamako to New York. I’d heard that flights to JFK were overbooked for four days and so there was no way around chilling out in the so-called “City of Lights” for a couple of days — but I welcomed the time to think and reflect about my journey through Mali to Timbuktu. It’s been roughly four months since my “Escape from Mali” — the ending of an emotionally draining, albeit memorable journey through the western African nation of Mali to the legendary-turned-anti-climactic city of Timbuktu (all of which have been immortalized in The Global Trip blog “Trippin’ to Timbuktu”). Since then, life has returned to a state of normalcy — if you considering working in a youthful NYC interactive advertising agency being “normal,” sending funny YouTube and ytmnd.com links to friends and coworkers all day.